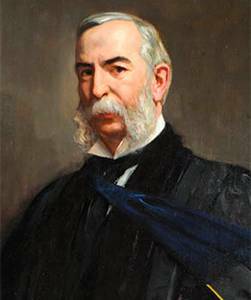 Daniel Coit Gilman became the first president of Johns Hopkins University on Feb. 22, 1876, in the Academy of Music at Howard and Centre streets in Baltimore. The governor of Maryland, the mayor of Baltimore, and representatives of a number of colleges and universities were among the distinguished guests. Gilman, 45, then stepped to the podium to deliver his inaugural address, which would set the tone for American higher education for the century to come. If this assembly, with one voice, could utter the thought now uppermost, there would be a deep, quick, hearty acknowledgment of the bounty of Johns Hopkins. His beneficence, so free, so great, so wise, promoting at once the physical, intellectual and moral welfare of his fellow-men, awakens universal surprise and admiration, and calls for our perpetual thanks. In respect to the giver, I can say but little to you, the citizens of Baltimore, who knew him so well; who remember his industry, sagacity and intellectual force; who have tested his integrity, and found that his word was as good as his bond; who recall his foresight, his enterprise, and his belief in the future of this city and state; who recollect that more than once in financial crises he hazarded his own fortune for the protection of others; who heard, it may be from his own lips, the motives and hopes which prompted these royal gifts; who believe that great acquisitions involve great responsibilities, but who know how hard it was for one long accustomed to power to yield that power to others; to you, his fellow-citizens, who saw the steps by which this benefactor toiled upward to the temple of Fortune, and there unsatisfied, went higher, by more arduous steps, to the temple of Charity, where he bestowed his gifts. While I leave to others the commemoration of our founder, you must let me refer to the tributes of admiration which his generosity has called out on the remotest shores of our own land, and in the most venerable shrines of European learning. The Berkeley laurel and the Oxford ivy may well be carved upon his brow when the sculptor shapes his likeness; for by wise men in the east and by rich men in the west, his gifts are praised as among the most timely, the most generous, and the most noble ever bestowed by one, for all. The total amount of the public gifts of Johns Hopkins, is more than seven million dollars. The sum of $3,500,000 is appropriated to a university; a like sum to a hospital; and the rest to local institutions of education and charity. Let us compare these benefactions with some others. Thirty years ago, when the gift of Abbott Lawrence to Harvard College was made known it was said to be “the largest amount ever given at one time during the life time of the donor to any public institution in this country,”—the amount was $50,000; the gift of Smithson, so well administered in Washington, amounted to over half a million; the foundation of Stephen Girard surpassed two million dollars. You may see from these figures what great munificence has brought us together. So far as I can learn, the Hopkins foundation, coming from a single giver, is without a parallel in terms or in amount in this or any land. But beware of exaggeration. These gifts are often spoken of as if the whole, instead of the half, was intended for the university, and then as if an equal amount was given to the hospital; and so it happens that dreams of monumental structures and splendid piles and munificent salaries flit through the mind which can never become real. Do not forget how much wealth is accumulated by older colleges—in repute, experience and influence, and also in material things. The property of Harvard College is more than five million dollars; that of Yale must equal our endowment. The land investments of a university in the Northwest are said to exceed these values; and Ezra Cornell, while he lived, expected that the endowments at Ithaca would approach, if not surpass, the funds of Harvard. The income yielding funds of Harvard in 1875 were over three million; those of Yale near a million and a half. Even these figures look small compared with the accumulations of Oxford and Cambridge. Now turn our capital into income. Our university fund yields a revenue of nearly $200,000. Let us compare this amount with the resources of our two richest colleges. Harvard, in 1874-5, (in all departments), received from tuition $168,541.72; from property, $218,715.30; a total of $387,257.02. The college alone, not including the library, the general administration, or any of the special departments, cost $187,713.20, which is nearly our whole income. Yale College reports its academical expenses (i.e., exclusive of those in the scientific, theological, law, medical and art departments), in 1874-5, as $126,073.56. But all our revenue is not at once available; for, as the capital cannot be spent for buildings, some income must be reserved for this. Of course, the buildings will be good and costly. If now we deduct from our income, as a building fund, one hundred thousand dollars annually, it will take several years to accumulate the requisite amount. Of that which remains a large sum will be absorbed by taxation, administration and the purchase of books, instruments and collections. Thus it is evident that the educational income at present is not large. Its expenditure requires great discretion and prudence. The trustees are men of liberal views in respect to professional salaries, but they see as clearly as a schoolboy sees through a problem in short division that the larger the divisor, the less the quotient; the more salary, the less chairs; the more eminent and costly the teachers, the fewer can be secured. I wish that every one who sees the need of a great university, and who knows the range of human science, would take a pencil and distribute our income in the departments which he would like to see promoted here. If his experience is like mine, he will find that before his pencil has half gone down the column of sciences, the income has been twice expended. I fear that these remarks are a little ungracious, and I would gladly repress them; but the private and public utterances of thoughtful men have been so vague as to what it is possible for the trustees of this university to accomplish at once, and our friends are so very generous in their expectations that I feel compelled, at the very outset, to utter a word of caution. If our physicists could bring us “Aladdin s lamp,” or our chemists produce “the philosopher s stone,” or our merchants give us “the widow s cruse,” our aspirations should not be checked by our restricted means; but, till the original benefaction is supplemented by other gifts, or the growth of Baltimore increases the value of our present investments, we must be contented with good work in a limited field. To many the magnitude of our founder s bounty seems its principal value; that is, in fact, but half its glory. With a self-renunciation which is rare and noble, he attached to the gift no burdensome condition or personal whim. The almoners of his bounty are restrained by no shackles bequeathed by a departed benefactor, as they enter upon their course bearing in the one hand the ointment of charity and in the other the lamp of science. His trustees are free—free to determine principles, to decide upon methods, to distribute income, to select professors, to summon students, and even to alter, from time to time, their own plans—as the enlightenment of the world bestows its radiance upon their undertaking. In selecting trustees the choice of our founder fell upon those of his friends and acquaintances whom he believed would be free from a desire to promote, in their official action, the special tenets of any denomination or the platform of any political party In a land where almost every strong institution of learning is either “a child of the church” or “a child of the state,” and is thus liable to political or ecclesiastical control, he has planted the germ of a university which will doubtless serve both church and state the better because it is free from the guardianship of either. It was his wish—it is our wish—that here should be a seat of learning so attractive that at its threshold students would gladly cease to discuss sectarian animosities and political prejudices, in their eagerness for the acquisition of Knowledge and their search for Eternal Truth. As in olden time the courtier s and the peasant s sons laid aside their distinctive costumes when they donned the academic dress, let us hope that here the only badges will be those which mark the scholar. Another advantage attends our foundation. It is established in a large town, in an old state, near to the financial and the political Capitals of the Republic; and at the junction of national highways which connect the North and the South, the East and the West. This is in fact a metropolis or middle city. Such geographical considerations will surely affect our future. Baltimore, moreover, is prepared for this foundation. Professional schools of law, medicine and theology already attract large numbers of students. Technical instruction in the useful arts is to some extent provided in the Maryland Institute. The votaries of the natural sciences are associated in an Academy, which only needs an endowment to enable it to take rank with kindred societies elsewhere. The city, with a liberality which is praised at home and abroad, maintains two excellent high schools for young ladies, and for young men a City College, so well organized, so well taught and so well supported, that it relieves our foundation of doing much which is called “collegiate” in distinction from “university” work. There are good private schools. There are excellent collections of paintings and rare opportunities for the study of music, both as a science and an art. More than all this the foundation of George Peabody, in which a capital of a million and a quarter of dollars is forever set apart for the pro- motion of culture, has now, with increasing strength, survived the perils of infancy, and gained a place among the very best establishments to be found in any part of our land. Its library is extraordinary for our country; not because of its size, (some 60,000 volumes) but because it has been selected with an experienced eye, among the most modern and most useful of the publications of the world. The advantage which will come to the new University in its medical department from the establishment of a hospital, on a separate but allied foundation, is most obvious. Obvious though it is, the most enlightened can not over-estimate its value. If so large a sum as the hospital fund ($3,500,000) were consecrated under any circumstances to the relief of suffering, the promotion of health, and the preservation of life—humanity would rejoice; but when such a foundation is connected with a university, so that on the one hand it commands all the resources of human learning, and on the other makes known through accomplished teachers the results of its experience, we may confidently expect that its influence for good will be more than doubled; that its immediate work in the care of the sick and wounded will be better done than would otherwise be possible; and that its remedial and preventive agencies will extend to thousands who may never come within its walls, but whose ills will be relieved by those taught here. The timeliness of our foundation is the last of the advantages which I shall name. We begin our work after discussions lasting for a generation respecting the aims, methods, deficiencies, and possibilities of higher education in this country; after numerous experiments, some with oil in the lamps and some without; after costly ventures of which we reap the lessons, while others bear the loss; after Jefferson, Nott, Wayland, Quincy, Agassiz, Tappan, Mark Hopkins, Woolsey, have completed their official services and have given us their supreme decisions; while the strong successors of these strong men, Eliot, Porter, Barnard, White, Angell and McCosh, are still up on the controversial platform; we begin after the national bounty has for fourteen years, under the far-reaching bill of Senator Morrill of Vermont, promoted scientific education; and after scores of wealthy men have bestowed many million dollars for the foundation of new institutions of the highest sort. Educational discussions and movements are not restricted to our new country. In old England, questions like these are constantly rife, (in addition to many of purely local interest): How may professorships in the old universities be restored to the dignity or influence, of which they have been in part deprived by the excessive preponderance of collegiate instruction; how may the university influences be extended to all the large towns; how may science gain a more generous recognition in the ancient seats of learning; how may endowments for research be established without leading to sinecure fellowships; how may ecclesiastical fetters be removed from academic institutions; how may the universities, by their systems of local examinations, best promote the welfare of the preparatory schools, or the training of young persons who are not likely to enter the university; how may the university better provide for the innumerable modern callings, which lie outside of the old “professions” but require an equal culture. In France, there has not been since the Revolution, I presume, such interest in the promotion of universities as now. I pronounce no opinions, but I call attention to the remarkable law which was passed last year, relinquishing the exclusiveness of a State foundation, and declaring university instruction to be free. Those who have hitherto been oppressed, as they have thought, by a hard law, now seize with alacrity the opportunity to found new institutions, and the offerings of the faithful are freely poured out to restore to the Church those intellectual agencies from which she has been cut off. At a distance, Germany seems the one country where educational problems are determined; not so, on a nearer look. The thoroughness of the German mind, its desire for perfection in every detail, and its philosophical aptitudes are well illustrated by the controversies now in vogue in the land of universities. In following, as we are prone to do in educational matters, the example of Germany, we must beware lest we accept what is their cast off; lest we introduce faults as well as virtues, defects with excellence. Some of the ablest men in the new empire I are now questioning whether “the Real School” system, after a trial of so many years, is justified of its works—and whether “the gymnasium,” somewhat modified, should not be the training place of all who seek a higher culture. Others are questioning whether it is not a mistake to maintain polytechnic schools, and special schools of agriculture, forestry, mining, etc., apart from the universities; and whether it would not be better to combine the higher educational foundations under one direction and in one centre. Some of the best scientific men declare their belief that the university instruction in science, following the gymnastic discipline, is better far as a preparation for what are called the modern pursuits, than the training which is given by the Real school and the Polytechnic, and so they assert that an exaggerated value has been attached to technical training. I only allude to these discussions in passing. It would take many hours to unfold them. But it is well to bear in mind that the most enlightened institutions in our country, and the most enlightened countries in Europe, are those in which educational discussions are now most lively; and it behooves us, as we engage in a new undertaking, to listen, ponder, and observe; and above all to be modest in the announcement of our plans. It should make the authorities cautious in offering, and the public cautious in demanding a completed scheme for the establishment of a university in Baltimore. Our caution is nonetheless needed when we remember that at the present moment Americans are engaged in promoting the institutions of higher education in Tokyo, Peking and Beirout, in Egypt and the Hawaiian Isles. The oldest and the remotest nations are looking here for light. W7hat is the significance of all this activity? It is a reaching out for a better state of society than now exists; it is a dim but an indelible impression of the value of learning; it is a craving for intellectual and moral growth; it is a longing to interpret the laws of creation; it means a wish for less misery among the poor, less ignorance in schools, less bigotry in the temple, less suffering in the hospital, less fraud in business, less folly in politics; it means more study of nature, more love of art, more lessons from history, more security in property, more health in cities, more virtue in the country, more wisdom in legislation, more intelligence, more happiness, more religion. The institutions which are founded in modern society for the promotion of superior education may be grouped in five classes: 1, UNIVERSITIES; 2, LEARNED SOCIETIES; 3, COLLEGES; 4, TECHNICAL SCHOOLS; and 5, MUSEUMS, (including literary and scientific collections). It is important that the fundamental ideas of these various institutions should be borne in mind. The University is a place for the advanced special education of youth who have been prepared for its freedom by the discipline of a lower school. Its form varies in different countries. Oxford and Cambridge universities, are quite unlike the Scotch, and still more unlike the Queen s University in Ireland; the University of France has no counterpart in Germany; the typical German universities differ much from one another. But while forms and methods vary, the freedom to investigate, the obligation to teach, and the careful bestowal of academic honors are always understood to be among the university functions. The pupils are supposed to be wise enough to select, and mature enough to follow the courses they pursue. The Academy, or Learned Society, of which the Institute of France, with its five academies, and the Royal Society of London, are typical examples—is an association of learned men, selected for their real or reputed merits, who assemble for mutual instruction and attrition, and who publish from time to time the papers they have received and the proceedings in which they have engaged. The University is also an association of learned men, but the bond which holds them together differs essentially from that of the academy. In the universities teaching is essential, research important; in academies of science research is indispensable, tuition rarely thought of. The College implies, as a general rule, restriction rather than freedom; tutorial rather than professorial guidance; residence within appointed bounds; the chapel, the dining hail, and the daily inspection. The college theoretically stands in loco parentis; it does not afford a very wide scope; it gives a liberal and substantial foundation on which the university instruction may be wisely built. The Technical Schools present the idea of preparation for a specific calling, rather than the notion of a liberal culture. They have in view the imparting of knowledge which will be useful in the practice of a profession, and often set forward as a motive, and assured introduction to the openings which are ready for those who have received their training. Museums, Galleries and Libraries, (of which the British Museum is the grandest type), are indeed connected with the other agencies we have named, but they often have an independent existence. They fulfill a two-fold purpose. They preserve and store away the treasures of art, literature and science; and they distribute widely among the people those seeds of culture which are developed by artistic, historic and scientific acquisitions. Thus we say that the Academy of Sciences promotes the intellectual attrition of the most learned men; the University favors the liberal and special culture of advanced students; the College trains aspiring youth for their future intellectual freedom; the Technical School affords a good preparation for a specific vocation; and the Museum provides materials for study, adapted like the world itself, to interest the most profound and the most superficial. Now it is clear that we might have a University without the four adjuncts I have named; and we might have the four accessories without the University, but practically wherever a strong University is maintained, these four-fold agencies revolve around it. It is the sun and they are the planets. In Baltimore you have hitherto had a College, an Academy of Sciences, Professional Schools and a Scholars Library, but you have not had such an endowed University as that which is now inaugurated. The earliest foundations in our country were colleges, not universities. Scholars were often graduated early in this century at the age when now they enter. Earnest efforts are now making to establish universities. Harvard, with a boldness which is remarkable, has essentially given up its collegiate restrictions and introduced the benefits of university freedom; Yale preserves its college course intact, but has added a school of science and developed a strong graduate department; the University of Michigan and Cornell University quite early adopted the discipline of universities, and already equal or pass not a few of their elder sisters; the University of Virginia from its foundation has upheld the university in distinction from the college idea. The cry all over the land is for university advantages, not as superseding but as supplementing collegiate discipline. As we, my friends, are called upon to develop a university, it becomes important not only to distinguish its essential idea from that of any other institution, but also to form a clear conception of its special province; of various plans which have governed its organization; of the good which it promotes; of the questions which are settled; of the questions which are not settled; and especially of the bearing of all these points on our land, our times, our foundation. Thus only shall we make a contribution to the intellectual agencies of this country, and add a positive gain to American learning and education in the second century of the Republic. Is, then, anything settled in respect to university education? Much, very much. Can we draw a statement of what is agreed upon? At any rate we can try. The schedule will include twelve points on which there seems to be a general agreement. 1. All sciences are worthy of promotion; or in other words, it is useless to dispute whether literature or science should receive most attention, or whether there is any essential difference between the old and the new education. 2. Religion has nothing to fear from science, and science need not be afraid of religion. Religion claims to interpret the word of God, and science to reveal the laws of God. The interpreters may blunder, but truths are immutable, eternal and never in conflict. 3. Remote utility is quite as worthy to be thought of as immediate advantage. Those ventures are not always most sagacious that expect a return on the morrow. It sometimes pays to send our argosies across the seas; to make investments with an eye to slow but sure returns. So it is always in the promotion of science. 4. As it is impossible for any university to encourage with equal freedom all branches of learning, a selection must be made by enlightened governors, and that selection must depend on the requirements and deficiencies of a given people, in a given period. There is no absolute standard of preference. What is more important at one time or in one place may be less needed elsewhere and otherwise. 5. Individual students cannot pursue all branches of learning, and must be allowed to select, under the guidance of those who are appointed to counsel them. Nor can able professors be governed by routine. Teachers and pupils must be allowed great freedom in their methods of work. Recitations, lectures, examinations, laboratories, libraries, field exercises, travels, are all legitimate means of culture. 6. The best scholars will almost invariably be those who make special attainments on the foundation of a broad and liberal culture. 7. The best teachers are usually those who are free, competent and willing to make original researches in the library and the laboratory. 8. The best investigators are usually those who have also the responsibilities of instruction, gaining thus the incitement of colleagues, the encouragement of pupils, the observation of the public. 9. Universities should bestow their honors with sparing hand; their benefits most freely. A university cannot be created in a day; it a slow growth. The University of Berlin has been quoted as a proof of the contrary. That was indeed quick success, but in an old, compact country, crowded with learned men eager to assemble at the Prussian court. It was a change of base rather than sudden development. The object of the university is to develop character — to make men. It misses its aim if it produced learned pedants, or simple artisans, or cunning sophists, or pretentious practitioners. Its purport is not so much to impart knowledge to the pupils, as whet the appetite, exhibit methods, develop powers, strengthen judgment, and invigorate the intellectual and moral forces. It should prepare for the service of society a class of students who will be wise, thoughtful, progressive guides in whatever department of work or thought they may be engaged. Universities easily fall into ruts. Almost every epoch requires a fresh start. If these twelve points are conceded, our task is simplified, though it is still difficult. It is to apply these principles to Baltimore in 1876. We are trying to do this with no controversy as to the relative importance of letters and science, the conflicts of religion and science, or the relation of abstractions and utilities; our simple aim is to make scholars, strong, bright, useful and true. This brings me to the question which has brought you here. The Johns Hopkins University: What will be its scope? The Trustees have decided to begin with those things which are fundamental and move gradually forward to those which are accessory. They will institute at first those chairs of language, mathematics, ethics, history and science which are commonly grouped under the name of the Department of Philosophy. The Medical Faculty will not long be delay that of Jurisprudence will come in time; that Theology is not now proposed. I have lately met with an ancient saying in respect to the development of a youth. “At five,” the precept read, “he was to study the Scriptures; at ten, the Mishna; at thirteen, the Talmud; at eighteen to marry; at twenty, to attain riches; at thirty strength; at forty, prudence, and so on to the end.” So we begin with the essential, proceed to the important, expect enlarged endowments, strength, prudence and the other virtues as we grow in years. In organizing a faculty, the first chairs to be filled are those which everywhere, always people in the modern Republic of Letters, are regarded as needful. ‘We must provide for the study of languages, ancient and modern; math and applied; science, natural and physical. All this is assumed as granted. But if we should do all this well and do nothing more, we should not add much to the intellectual resources of the country. ‘We must ask ourselves other questions: What special departments of learning are now neglected in the higher institutions of this country? What can we provide for? In what order shall we proceed? These problems require profound consideration; their answer must depend on manifold conditions; their solution will doubtless be the result of many counsels. Partly to elicit the suggestions of other teachers, and partly to exhibit what seem to me the inevitable demands of this place, I shall suggest some of the departments of higher education which seem to require attention from us. I cannot now tell all I think and hope. As a fundamental proposition, bear in mind that we shall aim to choose the fittest teachers, and shall then expect them to do their very best work. None but a college officer will appreciate all that this brief sentence carries with it. When we turn to the existing provisions for medical instruction in this land and compare them with those of European universities; when we see what inadequate endowments have been provided for our medical schools, and to what abuses the system of fees for tuition has led; when we see that in some of our very best colleges the degree of Doctor of Medicine can be won in half the time required to win the degree of Bachelor of Arts; when we see a disposition to treat diplomas as blank paper by the civilians at home and the profession abroad; when we read the reports of the medical faculty in their own professional journals; when we see the difficulties which have been encountered at Harvard, Yale,. and elsewhere, in late attempts to reorganize the medical schools; when we see the prevalence of quackery vaunting its diplomas, it is clear that something should be done. Then, turning to the other side of the picture, when we see what admirable teachers have given instruction among us in medicine and surgery; what noble hospitals have been created; what marvelous discoveries in surgery have been made by our countrymen; what ingenious instruments they have contrived; what humane and skillful appliances they have provided on the battlefield; what admirable measures are in progress for the advancement of hygiene and the promotion of public health; when we see what success has attended recent efforts to reform the system of medical instruction; when we observe all this, we need not fear that the day is distant—we may rather rejoice that the morning has dawned which will see endowments for medical science as munificent as those now provided for any branch of learning, and schools as good as those which are now provided in any other land. It will doubtless be long, after the opening of the University, before the opening of the Hospital, and this interval may be spent in forming plans for the Department of Medicine. But in the meantime we have an excellent opportunity to provide instruction antecedent to the professional study of medicine. At the present moment medical students avoid the ordinary colleges. A glance at the catalogues is enough to show that the usual classical or academic course is unattractive to such scholars. The reasons need not be given here. But who can doubt that a course may be maintained, like that already begun in the Sheffield School at New Haven, which shall train the eye, the hand and the brain, for the later study of medicine? Such a course should include abundant practice in the laboratories of chemistry, zoology and physics; the study of the anatomy, physiology, and pathology of the lower forms of life; an investigation of the elements of physics and mechanics, and of climatic and meteorological laws; the geographical distribution of disease; the remedial agencies of nature and art; and, besides these scientific studies, the student should acquire enough of French and German to follow with ease European science, and enough Latin for his professional needs. In other words, in our scheme of a university, great prominence should be given to the studies which bear upon Life—the group now called Biological Sciences. Such facilities as are now afforded under Huxley in London, and Rolleston at Oxford, and Foster at Cambridge, and in the best German universities, should here be introduced. They would serve us in the training of naturalists, but they would serve us still more in the training of physicians. By the time we are ready to open a school of medicine, we might hope to have a superior, if not a numerous, body of aspirants for one of the noblest callings to which the heart and head can be devoted. When the medical department is organized, it should be independent of the income derived from student fees, so that there may not be the slightest temptation to bestow the diploma on an unworthy candidate; or rather let me say, so that the Johns Hopkins diploma will not be a greenback, but will be worth its face in the currency of the world. Next to the study of Man, in his relations to Nature, comes the study of Man in his relations to Society. By this I mean his history, as exemplified in the monuments of literature and art, in language, laws and institutions, in manners, morals and religion. More particularly still I refer to the principles of good government, including jurisprudence on the one hand, and political economy on the other. Legislation, taxation, finance, crime, pauperism, municipal government, morality in public and private affairs, are among the special topics. The civil law, international law, the early history of institutions, in short, the history of civilization and the requirements of a modern State come under this department. If we may judge from what is said by some of the best publicists, the United States, at this moment, is suffering from the neglect of these studies. There is a call for men who have been trained by other agencies than the caucus for the discussion of public affairs; men who know what the experience centre of population, where fifteen or twenty thousand persons are assembled, should have the services of a competent scientific engineer. He must of course have a general mathematical training; but he should also know how to use these fundamental principles in municipal affairs, in the preparation of exact maps, in the determination of the supplies of water, and the methods of drainage, in the construction of roads, boulevards, pleasure grounds and parks, the building of wharves and docks, the supervision of gas works and fire engines, the erection of public buildings, monuments and places of assembly. There should be a recognized preparation for this work of civic or municipal engineering — in distinction from civil engineering, which is a more vague and general term, including perhaps the subordinate branches to which I have referred. Architecture is closely connected with this department. So far as I am aware there are now, in this new country where so much building is in progress, but two schools for the professional study of this, the first of arts. I can hardly doubt that such arrangements as we are maturing will cause this institution to be a place for the training of professors and teachers for the highest academic posts; and I hope in time to see arrangement made for the unfolding of the philosophy, principles and methods of education in a way which will be of service to those who mean to devote their lives to the highest departments of instruction. But in forming all these plans we must beware lest we are led away from our foundations; lest we make our schools technical instead of liberal; and impart a knowledge of methods rather than of principles. If we make this mistake, we may have an excellent Polytechnicum but not a University. Who shall our teachers be? This question the public has answered for us; for I believe there is scarcely a preeminent man of science or letters, at home or abroad, who has not received a popular nomination for the vacant professorship. Some of these candidates we shall certainly secure, and their names will be one by one made known. But I must tell you, in domestic confidence, that it is not an easy task to transplant a tree which is deeply rooted. It is especially hard to do so in our soil and climate. Though a migratory people, our college professors are fixtures. Such local college attachments are not known in Germany; and the promotions which are frequent in Germany are less thought of here. When we think of calling foreign teachers, we encounter other difficulties. Many are reluctant to cross the sea; and others are, by reason of their lack of acquaintance with our language and ways, unavailable. Besides we may as well admit that London, Paris, Leipsic, Berlin and Vienna, afford facilities for literary and scientific growth and influence, far beyond what our country affords. Hence, ‘it is probable that among our own countrymen, our faculty will be chiefly found. The young Americans of talent and promise—there is our strength, and a noble company they are! We do not ask from what college, or what state, or what church they come; but what do they know, and what can they do, and what do they want to find out. In the biographies of eminent scholars, it is curious to observe how many indicated in youth preeminent ability. Isaac Casaubon, whose name in the sixteenth century shed lustre on the learned circles of Geneva, Montpellier, Paris, London, and Oxford, began as professor of Greek at the age of twenty-two; and Heinsius, hey Leyden contemporary, at eighteen. It was at the age if twenty-eight, that Linnaeus first published in Systema Natur’. Cuvier was appointed a professor in Paris at twenty-six, and, a few months later, a member of the Institute. James Kent, the great commentator on America law, began his lectures in Columbia College at the age of thirty- one. Henry was not far from thirty years of age when he made his world-renowned researches in electro-magnetism; and Dana’s great work on mineralogy was first published before he was twenty-five years old, and about four years after he graduated at New Haven. Look at the Harvard list: -Everett was appointed Professor of Greek at twenty-one; Benjamin Peirce of Mathematics at twenty-four; and Agassiz was not yet forty when he came to this country. For fifty years Yale College rested in three men selected in their youth by Dr. Dwight, and almost simultaneously set at work; Day was twenty-eight, Silliman, twenty-three, and Kingsley, twenty-seven, when they began their professorial lives. The University of Virginia, early in its history, attracted foreign teachers, who were all young men. We shall hope to secure a strong staff of young men, appointing them because they have twenty years before them; selecting them on evidence of their ability; increasing constantly their emoluments, and promoting them because of their merit to successive posts, as scholars, fellows, assistants, adjuncts, professors and university professors. This plan will give us an opportunity to introduce some of the features of the English fellowship and the German system of privat-docents; or in other words, to furnish positions where young men desirous of a university career may have a chance to begin, sure at least of a support while awaiting for promotion. Our plans begin but do not end here. As men of distinction, who have won the highest rank in their callings, are known to be free, we shall invite them to come among us. For a time, at least, we shall also look to the faculties of other colleges for occasional help. Many years ago, among the plans for establishing a university, in distinction from a college, at Cambridge, Professor Peirce proposed that various colleges should send up for a portion of the year, and for a term of years, their best professors, who should receive a generous acknowledgment for this service, and good opportunities for work, but should not renounce their college homes. Without having heard of his plan, which I think had not been made public, the Trustees of the Johns Hopkins University have worked out a kindred scheme. They propose to ask distinguished professors from other colleges to come to us during a term of years, each to reside here for an appointed time, and be accessible, publice et privatim, both in the lecture room and the study. Where do we look for students? At first, at home, in Baltimore and Maryland; then, in the States adjacent; then, in the regions of our country where by the desolations of war, educational foundations have been impaired; and presently, according to the renown of the faculty, which we are able to bring here, and the completeness of the establishment, we hope that our influence will be national. Of what grade will they be? Mature enough to be profited by university education. The exact standard is not yet fixed. It must depend on the colleges and schools around us; there must be no gap in the system, and we must keep ahead, but the discussions now in progress, respecting the City College, Agricultural College and St. John s College, must delay our announcements. Our standard will doubtless be as high as the community requires. What will the buildings be? At first, temporary, but commodious; in the heart of the city, accessible to all; and fitted for lectures, laboratories, library and collections:. At length, permanent, on the site at Clifton; not a medieval pile, I hope, but a series of modern institutions; not a monumental, but a serviceable group of structures. The middle ages have not built any cloisters for us; why should we build for the middle ages? In these days laboratories are demanded on a scale and in a variety hitherto unknown, for chemistry, physics, geology and mineralogy, comparative anatomy, physiology, pathology. Oxford with its New Museum; Cambridge with its Cavendish laboratory; Owens College with its excellent work-rooms; South Kensington with the new apartments of Huxley and Frankland; Leipsic, Vienna, Berlin, all afford illustrations of the kind of structures we shall need. Already measures have been initiated for the improvement of Clifton as a university site. Although it will take time to develop the plans, I hope that we shall all live to see the day when the simplicity, the timeliness, and the strength which characterized our founder s gift, will be also apparent in the structures which his trustees erect; and when that site, beautiful in itself and already well planted, may be, in fact, an academic grove, with temples of learning, so appropriate, so true, and so well built that no other ornament will be essential for beauty, and yet that in their neighborhood no work of art will be out of place. Our affiliations deserve mention. Already harmonious relations have been established between this University and the Peabody Institute, the Academy of Sciences, and the City College, and the departments of State and City Education. I may also add that the authorities of the scientific institutions in Washington have evinced in many ways good will toward their new ally in Baltimore. As this University grows, we may anticipate perpetual advantages from its proximity to the national- capital, where the Smithsonian Institution, the Engineer Corps, the Naval Observatory, the Coast Survey, the Signal Service the Botanical Gardens the Congressional Library, the National Museum, the Territorial Surveys, the Army Medical and Surgical Collections, and the Corcoran Art Gallery are such powerful instruments for the advancement of science, literature and art. The relation of this University to the higher education of women has not been as yet discussed by the Trustees, and doubtless their future conclusions will depend very much upon the way in which the subject is brought forward. I am not at liberty to speak for them, but personally have no hesitation in saying that the plans pursued in the University of Cambridge (England), especially in the encouragement of GIRTON College, seem likely to afford a good solution of a problem which is not without difficulty, however, it is approached. Of this I am certain, that they are not among the wise, who depreciate the intellectual capacity of women, and they are not among the prudent, who would deny to women the best opportunities for education and culture. I trust the day is near when some one, following the succession of Peabody and Hopkins, will institute here a “Girton College,” which may avail itself of the advantages of the Peabody and Hopkins foundations, without obliging the pupils to give up the advantages of a home, or exposing them to the rougher influences which I am sorry to confess are still to be found in colleges and universities where young men resort. For the establishment in Baltimore of such a hail as Girton I shall confidently look. If we would maintain a university, great freedom must be allowed both to teachers and scholars. This involves freedom of methods to be employed by the instructors on the one hand, and on the other, freedom of courses to be selected by the students. But this freedom is based on laws, — two of which cannot be too distinctly or too often enunciated. A law which should govern the admission of pupils is this, that before they win this privilege they must have been matured by the long, preparatory discipline of superior teachers, and by the systematic, laborious, and persistent pursuit of fundamental knowledge; and a second law, which should govern the work of professors, is this, that with unselfish devotion to the discovery and advancement of truth and righteousness, they renounce all other preferment, so that, like the greatest of all teachers, they may promote the good of mankind. I see no advantage in our attempting to maintain the traditional four-year class-system, of the American colleges. It has never existed in the University of Virginia; it is modified, through not nominally given up at Harvard; it is not known in the English, French or German Universities. It is a collegiate rather than a university method. If parents or students desire us to mark out prescribed courses, either classical or scientific, lasting four years, it will be easy to do so. But I apprehend that many students will come to us excellent in some branches of liberal education and deficient in others-good perhaps in Greek, Latin and mathematics; deficient in chemistry, physics, zoology, history, political economy, and other progressive sciences. I would give to such candidates on examination, credit for their attainments, and assign them in each study the place foe which they are fitted. A proficient in Plato may be a tyro in Euclid. Moreover, I would make attainments rather than times the condition of promotion; and I would encourage every scholar to go forward rapidly or go forward slowly according to the fleetness of his foot and his freedom from impediment. In other words, I would have our University seek the good of individuals rather than of classes. The sphere of a university is sometimes restricted by its walls, or is limited to those who are enrolled on its lists. There are three particulars in which we shall aim at extra- mural influence: first, as an examining body, ready to examine and confer degrees or other academic honors on those who are trained elsewhere; next, as a teaching body, by opening to educated persons (whether enrolled as students or not) such lectures as they may wish to attend, under certain restrictions—on the plan of the lectures in the high seminaries of Paris; and, finally, as in some degree at least a publishing body, by encouraging professors and lecturers to give to the world in print the results of their researches. Let us now, as we draw near the close of this allotted hour, turn from details and recur to general principles. An enduring foundation; a slow development; first local, then regional, then national influence; the most liberal promotion of all useful knowledge; the special provision of such departments as are elsewhere neglected in the country; a generous affiliation with all other institutions, avoiding interferences, and engaging in no rivalry; the encouragement of research; the promotion of young men; and the advancement of individual scholars, who by their excellence will advance the sciences they pursue, and the society where they dwell. No words could indicate our aim more fitly than those by which John Henry Newman expresses his “Idea of the University,” in a page burning with enthusiasm, to which I delight to revert. What will be our agencies? A large staff of teachers; abundance of instruments, apparatus, diagrams, books, and other means of research and instruction; good laboratories, with all the requisite facilities; accessory influences, corning both from Baltimore and Washington; funds so unrestricted, charter so free, schemes so elastic, that as the world goes forward, our plans will be adjusted to its new requirements. What will be our methods? Liberal advanced instruction for those who want it; distinctive honors for those who win them; appointed courses for those who need them; special courses for those who can take no other; a combination of lectures, recitations, laboratory practice, field work and private instruction; the largest discretion allowed to the Faculty consistent with the purposes in view; and, finally, an appeal to the community to increase our means, to strengthen our hands, to supplement our deficiencies, and especially to surround our scholars with those social, domestic and religious influences which a corporation can at best imperfectly provide, but which may be abundantly enjoyed in the homes, the churches and the private associations of an enlightened Christian city. Citizens of Baltimore and Maryland: This great undertaking does not rest upon the Trustees alone; the whole community has a share in it. However strong our purposes, they will be modified, inevitably, by the opinions of enlightened men; so let parents and teachers incite the youth of this commonwealth to high aspirations; let wise and judicious counsellors continue their helpful suggestions, let skillful writers, avoiding captiousness on the one hand and compliment on the other, uphold or refute or amend the tenets here announced; let the guardians of the press diffuse widely a knowledge of the benefits which are here provided; let men of means largely increase the usefulness of this work by their timely gifts. At the moment there is nothing which seems to me so important, in this region, and indeed in the entire land, as the promotion of good secondary schools, preparatory to the universities. There are old foundations in Maryland which require to be made strong, and there is room for newer enterprises, of various forms. Every large town should have an efficient academy or high school; and men of wealth can do no greater service to the public than by liberally encouraging, in their various places of abode, the advanced instruction of the young. None can estimate too highly the good which came to England from the endowment of Lawrence Sheriff at Rugby, and of Queen Elizabeth s school at Westminster, or the value to New England of the Phillips foundations in Exeter and Andover. Every contribution made by others to this new University will enable the Trustees to administer with greater liberality their present funds. Special foundations may be affiliated with our trust, for the encouragement of particular branches of knowledge, for the reward of merit, for the construction of buildings; and each gift, like the new recruits of an army, will be the more efficient because of the place it takes in an organized and efficient company. It is a great satisfaction in this world of changes and pecuniary loss to remember what safe investments have been made at Harvard and Yale, and other old colleges, where dollar for dollar is still shown for every gift. The atmosphere of Maryland seems favorable to such deeds of piety, hospitality and “good-will to men.” George Calvert, the first Lord Baltimore, comes here, returns to England and draws up a charter which becomes memorable in the annals of civil and religious liberty, for which, “he deserves to be ranked,” (as Bancroft says), “among the most wise and benevolent lawgivers of all ages;” among the liberals of 1776 none was bolder than Charles Carroll of Carrollton; John Eager Howard, the hero of Cowpens, is almost equally worthy of gratitude for the liberality of his public gifts; John McDonogh, of Baltimore birth, bestows his fortune upon two cities for the instruction of their youth; George Peabody, resident here in early life, comes back in old age to endow an Athen’um, and begins that outpouring of munificence which gives him a noble rank among modern philanthropists; Moses Sheppard bequeaths more than half a million for the relief of mental disease; Rinehart, the teamster boy, attains distinction as a sculptor, and bestows his well-won acquisitions for the encouragement of art in the city of his residence; and a Baltimorean still living, provides for the foundation of an astronomical observatory in Yale College; while Johns Hopkins lays a foundation for learning and charity, which we celebrate to- day. Let me enlist attention from the youth of Baltimore. For you, my young friends, these great advantages are provided. What will be your response? Is there not among you some bookbinder s boy, like Michael Faraday, who will be led by our Royal Institution to a line of research for which the world will be better; is there not here some private teacher, like Cuvier, or some minister s son, like Agassiz, burning with a desire to pursue the study of natural history; is there not some sophomore in college, like Alexander Hamilton, ready to discuss the questions of public finance, eager to be trained by a master economist; is there not in Baltimore a genius in mathematics, like Gauss, who at three years old corrected his father s arithmetic, at eighteen entered the University of Gottingen where he made a discovery which had puzzled geometers “from the days of Euclid,” and who died at seventy- seven, among the most eminent of his time? If so, I say it is for you, bright youths, that these doors are opened. Enter the armory and equip yourselves. Gentlemen of the Board of Trustees: The duty you assigned me of unfolding your plans is now imperfectly discharged. I hope that I have not struck too low a key in speaking of the opportunities, and on the contrary, that I have not said anything in rivalry or boast. If I have seemed cautious, you are sanguine, invigorated by the force of a lofty purpose, and the comforting consciousness of ample means. If I have seemed sanguine, you are cautious, aware that there are other institutions, older, richer, and more experienced than this, whose example we must study, and whose help we must seek. Before concluding, I repeat in public the assent which I have privately made to your official overtures. In speaking of your freedom from sectarian and political control, you expressed to me a hope that this foundation should be pervaded by the spirit of an enlightened Christianity; while you proposed to train young men for the service of the State and the responsibilities of public life, you hoped the University would never engage in sectional, partisan and provincial animosities. In both these propositions I now as then express my cordial and entire concurrence. Our work now begins. This place is felicitous, midway between the extremes of North and South, and redolent of memories of men and women whose names the world will never forget. This day is suggestive, reminding us of one whose wise moderation wrought great achievements. This year is auspicious, inviting us to sink political animosities in sentiments of fraternal good will, and of patriotic regard for a re-united republic. This company is inspiring; the city, the state, and the older seats of learning, far and near, here express their good will. Most welcome among their utterances are the words with which the oldest college in the land extends its fellowship to the youngest of the band. So, friends and colleagues, we launch our bark upon the Patapsco, and send it forth to unknown seas. May its course be guided by looking to the heavens and the voyage promote the glory of God and the good of Mankind.